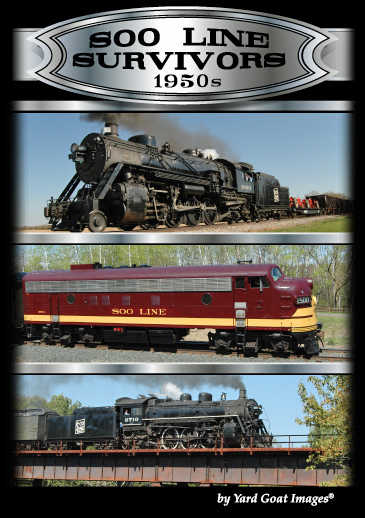 In the early 1950s, the Soo Line and its affiliated lines comprised a regional railroad system linking Minneapolis, Winnipeg, Duluth-Superior, Chicago, and its namesake city, Sault Ste Marie, Michigan. Agricultural products and manufactured goods moved on tracks stretching from Montana to the Great Lakes. The Soo faced post-war challenges of re-equipping its roster with diesels while getting the last miles from its steam locomotive fleet. Passenger service was an important but declining segment of the business in the early 1950s. 1003 - documents another legendary Autumn photo charter with the 2-8-2. Rural Wisconsin along with some spectacular sunset scenes. 2719 - celebrating the 4-6-2’s career on the North Shore Scenic Railroad (2007 - 2013) with favorite scenes from our years of covering her.